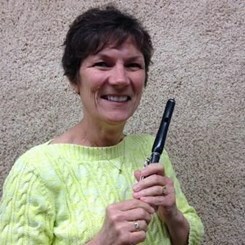 Interested in taking lessons with Amy H.
Amy Hartman, flute, is a graduate of Northwestern University, where she was a student of Walfrid Kujala (Chicago Symphony Orchestra), and the Cleveland Institute of Music, where she studied with Maurice Sharp (Cleveland Orchestra). She has performed with the Chicago Symphony Orchestra, the Lyric Opera of Chicago, the Grant Park Symphony Orchestra, the Chicago Philharmonic, the Chicago Sinfonietta , the Wichita Symphony Orchestra, the Elgin Symphony Orchestra, the Ravinia Festival Orchestra, the Chicago Opera Theater, Concertante di Chicago, the Madison Chamber Orchestra, the Green Bay Symphony, the Wisconsin Philharmonic, the Wisconsin Wind Orchestra,and the Lake Forest Symphony. She performs chamber music with the Drabot/Hartman flute and harp duo and is equally skilled in the “pops” genre, having worked with such artists as Peter Cetera, Art Garfunkel, the Beach Boys, Wynonna Judd, Johnny Mathis and many others. She has held teaching positions at DePaul University, the University of Wisconsin-Milwaukee, the University of Wisconsin Oshkosh, Lakeland College, and Harper College. Request Lessons with Amy H. today!